This Mojo Shrimp is a simple and tasty dish that will add a tropical flair to your weeknight meal. 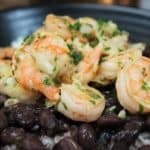 In this recipe, shrimp is marinated and cooked in a homemade Cuban style mojo and served with white rice and black beans. 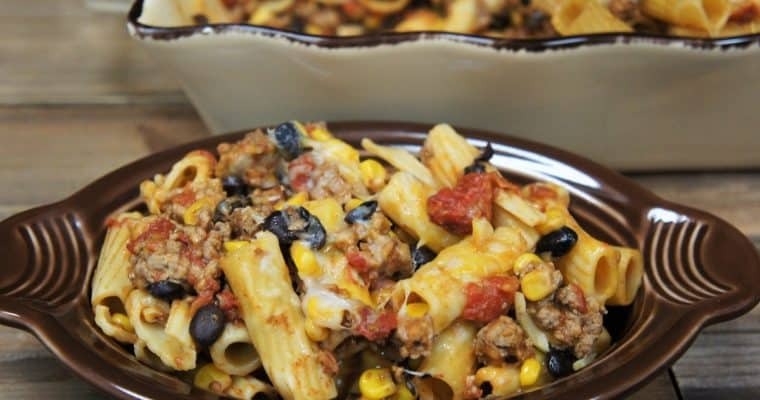 This meal is easy, filling and delicious, just what we all need for busy nights. Enjoy! Start the white rice. Add the black beans to a sauce pan and place over low to moderate low heat so they’re hot when the shrimp is done. If you’re making the sour orange juice: combine ¾ cup of orange juice (preferably fresh squeezed) and ¼ cup lime juice in a jar or bowl. Stir or shake the juice to combine well. Set aside until ready to use. Peel and smash the garlic. Add the garlic and about ½ tsp. kosher salt to a mortar and pestle. Work the garlic until you break it down into small, flat pieces. Add the smashed garlic, 1 tbsp. olive oil, oregano, cumin, ½ tsp. salt, and the bay leaf to the sour orange juice. Stir or shake to combine well. Let the marinade sit in the refrigerator for at least 30 minutes, a couple of hours is better. Shake or stir well before using. Add half the mojo and the shrimp to a large bowl, stir to mix well. Cover the bowl with plastic wrap and refrigerate for about 15 minutes. Don’t marinate the shrimp too long in citrus juice, it will start to cook the shrimp and they will become rubbery. Reserve the remaining mojo. Remove the shrimp from the refrigerator. Heat the remaining tbsp. of olive oil in a large, deep, non-stick skillet over medium heat. Remove the shrimp from the marinade using a slotted spoon and add to the skillet. Discard the leftover shrimp marinade. Remove and discard the bay leaf. Cook the shrimp for 3-4 minutes, stirring occasionally until they start to turn pink. Raise the heat to medium-high and add the remaining marinade to the skillet. Cook the shrimp for 5 minutes or so, or until cooked through, stirring frequently. 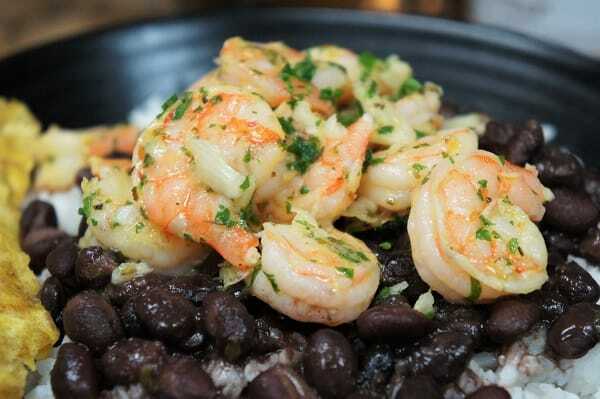 Serve the mojo shrimp with white rice and black beans. Sour oranges are used in many mojo recipes. During the latter part of the year, near the Christmas season, many Latin markets will stock sour oranges. If you can find them, slice in half and juice. If you can’t get sour oranges, because they’re not available in your area, or it’s not season, try combining orange juice (fresh squeezed is preferable) and lime juice usually at about a 2:1ratio. Two parts orange juice to one part lime juice, shake or stir to combine well. The last alternative is bottled sour orange juice, which is not really made with sour oranges (more like grapefruit juice and other citrus); however, it will still get that sour and sweet taste we’re looking for. Sour orange juice can be found in the international section of most large grocery stores, or find it online (although at a premium). 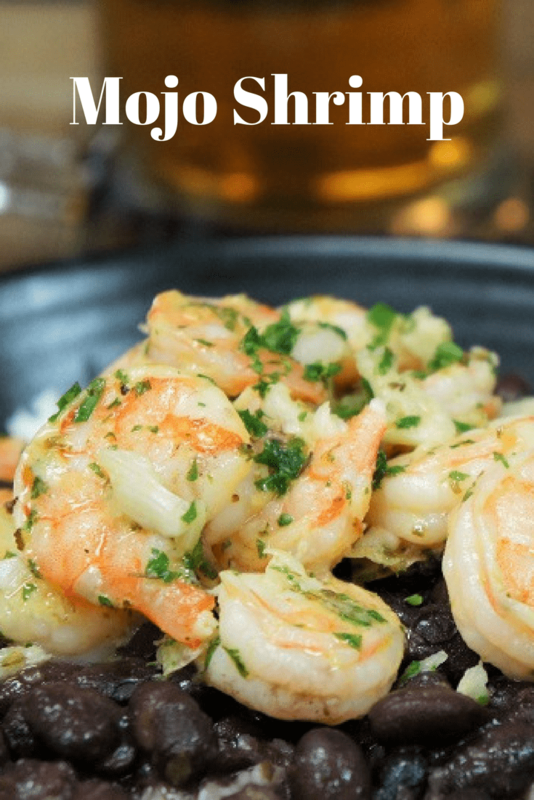 This Mojo Shrimp is a simple and tasty dish that will add a tropical flair to your weeknight meal. 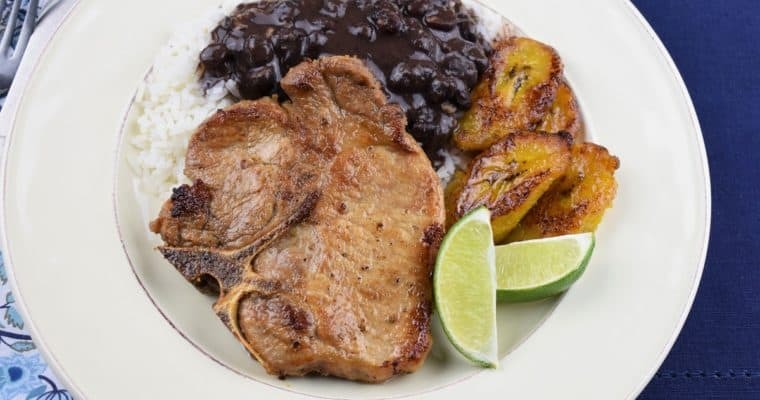 In this recipe, shrimp is marinated and cooked in a homemade Cuban style mojo and served with white rice and black beans. Start the white rice. Add the black beans to a sauce pan and place over low to moderate low heat so they're hot when the shrimp is done. Add the garlic and about ½ tsp. kosher salt to a mortar and pestle. Work the garlic until you break it down into small, flat pieces. Marinate the mojo shrimp - Add half the mojo and the shrimp to a large bowl, stir to mix well. Cover the bowl with plastic wrap and refrigerate for about 15 minutes. Don’t marinate the shrimp too long in citrus juice, it will start to cook the shrimp and they will become rubbery. Reserve the remaining mojo.